The Chirurgeon’s Apprentice blog brings us a little history of anthropodermic bibliopegy. (This includes a note about a Harvard Law Library book which, as the link above tells us, has since been proven to be bound in sheepskin, despite the claim in the back of the book.) The Wikipedia entry on anthropodermic bibliopegy is quite informative. 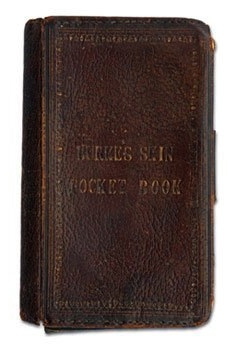 This BBC News Magazine post mentions other examples including this notebook made from the skin of William Burke (of Burke and Hare fame), and a book on virginity in the Wellcome collection with a note in the back about its binding by the same Ludovic Bouland who bound the Harvard book! I think we all reflexively think this sort of thing is revolting at least in part because of the stories about WWII excesses. If you can clear your mind of the revulsion factor, I suppose you could see a way in which someone might find this a somewhat touching way of memorializing a friend — is it really wildly different than keeping locks of hair, which I think we also find a bit creepy nowadays? (Cf. “Relics”) Of course we don’t know what we don’t know, but it seems a little odd to me that this form of commemoration was mostly focussed on the criminals not the benefactors of humanity. Maybe that’s just a result of availability. I bet someone has at least wished they could bind an author’s works in this way. In this context my earlier post “DNA ink” is relevant. It seems to me that the reason for binding criminals’ confessions in their own skin, but not memorializing loved ones this way is a reflection of our basic lack of respect for criminals as people. Some religions (Orthodox Judaism, for example) insist that the body remain whole at burial, so that it will be whole at the eventual believed-in resurrection. I’m sure others, even if they routinely expose or cremate, rather than burying their dead, likewise feel that the body must be intact prior to such treatment. Given this, removing and tanning a criminal’s skin would be the final act of desecration of the criminal’s body. By contrast, a lock of hair (which may well have been collected prior to death) represents something that the live person could regrow–a part of them, but not a disrespectful removal of something essential to that person’s ability to stay alive. Thank you. This does make sense.